ALPE D’HUEZ (VN) — Tour de France officials pulled aside and weighed the bikes of stage winner Christophe Riblon and yellow jersey Chris Froome, as well as Alberto Contador, Tejay van Garderen, and Joaquim Rodríguez following Thursday’s stage 18 finish atop l’Alpe d’Huez. The checks were to ensure compliance with the 6.8-kilogram (14.99 pounds) minimum weight limit enforced by cycling’s governing body, the UCI. Commissaires announced the checks mid-stage, though the list of targeted riders was not known until each crossed the finish line. Contador made two bike swaps during the stage, one prior to the first ascent up l’Alpe d’Huez, and one on the flat road before the second accent. The bike checks were announced between the two swaps, leading to speculation that Contador was forced to back off a long-range attack to swap back onto a UCI-legal bike for the finish climb. That doesn’t appear to be the case. UCI technological coordinator Mottet confimed with VeloNews that both of Contador’s bikes were checked following the stage, and both came in at exactly 6.8kg. In fact, all six bikes the UCI tested landed right on the 6.8kg mark. Had they fallen under the limit, riders could have faced expulsion from the race. Only a few weeks ago, Fabiana Luperini was thrown out of the Giro Rosa while sitting in second place for failing a UCI weight check. Her bike was more than 100 grams under the weight limit. Mottet denied that Contador’s first bike swap spurred the decision to perform checks, stating that the decision to check bikes at the mountaintop finish was made at that start Thursday morning. “We have to check sometimes that the rules are followed by the riders. It was decided at the beginning,” Mottet said. The bike checks began with van Garderen’s BMC Team Machine SLR01, within minutes of his finish, and ended with Froome’s Pinarello Dogma 65.1 nearly 40 minutes later. That’s more than enough time for a mechanic to slip some extra weight on to the bike, of course. There is no bike chaperone or chain of custody, as there is with doping controls. But Mottet believes bikes were not tampered with. “I was not on the race, so it’s difficult to be sure 100 percent, but we have four international commissaires on the race, more on the bikes, so I’m pretty sure that if a rider changed his bikes we would know,” he said following the stage. Sky sport director Nicolas Portal brought Froome’s bike to the UCI’s tent, accompanied by a UCI commissaire. He was nonplussed by the checks, despite the late notice. “Normally, they say nothing; it’s a surprise. They just say, ‘Ok, your bike, your bike, your bike,’ at the finish. 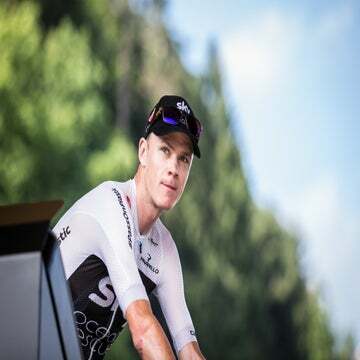 It’s a gamble, just like anti-doping,” he said, adding that between his road and time trial bikes, Froome has had his equipment checked nearly 20 times this Tour.